Guerilla gardening, guerilla knitting ('yarn bombing' in the US), punk sculpture, even graffiti – I love the ways in which people interact with their environments, little acts of self-expression for no material gain, merely the pleasure of making your mark. Who put it there? Did they arrive by night, needles at the ready, watched only by foxes and roosting birds? A little further on we found a tree full of waxwings, garrulous winter visitors, their bright wings and crests dressing the bare branches like baubles. We stopped to watch them, a greater spotted woodpecker shouting alarums at our dog far below. Barrspæta, the Scandinavian waxwings might call him, or käpytikka. 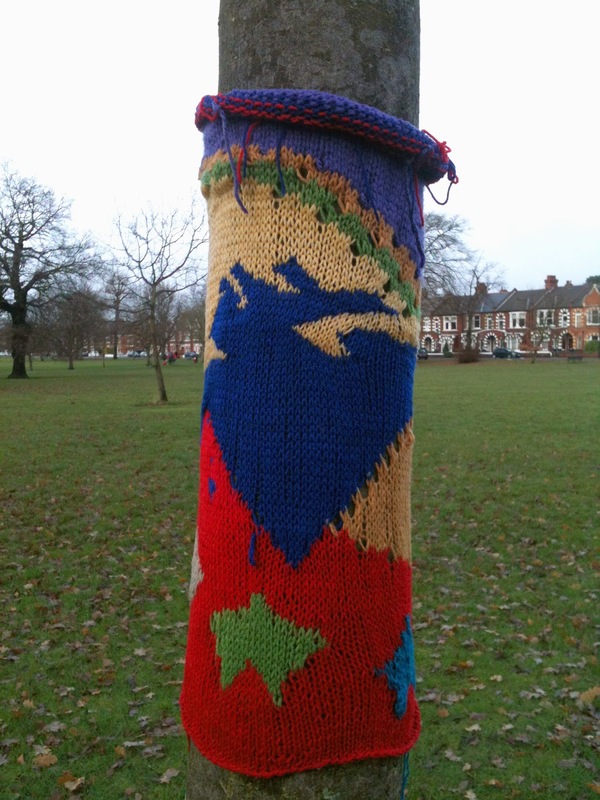 Perhaps he saw who kitted the tree out in knitwear; perhaps he knows all the secrets of the park.